Let me start by saying that I wrote it first. A motivated librarian in Austintown, Ohio, offered to place my book in the library if I would write it. I was eight or thereabouts and had no idea what to write about. She suggested a favorite place or something else that I liked. (If only she knew what she was starting.) I chose my favorite color. That is how I wrote The Color Purple (apologies to Alice Walker). Needless to say, I was well primed for Prince. For my entire life, I have been late to every party on the music home-front. That’s all right. I get there eventually. But for a white kid going to school in the Midwest, specifically Appalachia, I got to Prince about as soon as I was going to. Somewhere I got hold of a then current copy of The Rolling Stone Illustrated History of Rock and Roll. While I devoured its contents, it re-enforced a lot of information that I had absorbed from my older brothers and the world around me. The book had chapters on artists the editors felt important. As I recall, only one of those was about someone who had not broken through to major popularity yet (and many were long past their prime). That was this kid from Minneapolis who was making records all by himself and tearing up the stage. The writer said that Prince was as close to Jackie Wilson and Jimi Hendrix as we might ever get. I had recently really gotten into Hendrix and Wilson, so I had to check this dude out. through the two record stores in our tiny college town and located a copy of Controversy. I liked it, but I was not ready to go where a fair bit of it pointed. 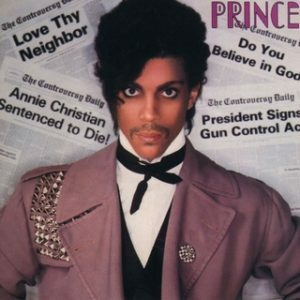 This one short song, though- this odd political rant that sounded like Prince had been listening to The Clash– this odd little thing seemed to point to an interesting future. Then I filed the record under “P” and forgot about it. I don’t know when I heard Little Red Corvette for the first time, but I knew who it was. I worked as a DJ then and I played every track off 1999. My brain and the world were starting to catch up. Then Prince made a movie. Purple Rain was about a Midwestern kid bringing people of all races together. That’s the movie that I saw then and saw again when I watched it a couple years ago. More like David Bowie than Michael Jackson, Prince kept making great music and provided less and less fodder for gossip as time passed. He inspired a loyal fan base and seemed to make a lot of good choices. And now he is dead, which is a very weird thing to write, even though we have all known this for months and months. As all the fans know, Prince created a vault-full of music that has never seen the light of day. He made allusions to releasing sometime, but only when he got around to it. While he lived, this left fans with what is best described as Schrodinger’s music. Does it really exist if no one has mixed it? Or heard it? That sounds more flippant than intended. The main thing about that vault is that it holds the promise of a future which was supposed to include the artist himself. We move so quickly from adoration to scavenging, but how else can we treat newly discovered art? We feed our most mercenary desires when we profit from the work of the dead without reference to the original artist. You’ve Got to Check This Out is a blog series about music, words, and all sorts of artistic matters. It started with an explanation. 209 more to go.